With winter and heating season just around the corner, it’s more important than ever to make sure you have working smoke and CO detectors. Carbon monoxide (CO) is produced whenever fuel is burned, and if it builds up in your home, it can cause serious symptoms like confusion, nausea, and even sudden death. Smoke, of course, indicates a fire, and your smoke alarm ringing could be the reason you make it out alive. The United States Fire Administration recommends checking your smoke detector batteries once a month, and it’s a good idea to check your CO detector batteries at the same interval. Most smoke alarms and CO detectors begin beeping when the batteries are about to die, but it is possible for this feature to malfunction, so checking the batteries manually is a good extra precaution to take. Usually, you can check that the battery is working just by pushing a button on the alarm. If it beeps, your battery is good. Whether or not they quit working, you should replace the batteries in your smoke and CO detectors twice a year. Once in the fall and once in the spring will suffice! Batteries can leak and become drained as they age, so changing them often protects against this issue. Don’t under-estimate the importance of a working CO and smoke detector. CO poisoning causes more than 400 deaths per year in the United States, and studies show that the risk of dying in a home fire is reduced by 50% just by having a working smoke alarm. You should also take a moment this fall to make sure you have the proper number of smoke and CO detectors in your home, and that they are properly located. You should have a CO detector on each floor, including the floor where your furnace is located. Place it at least five feet up on the wall, and make sure there is one near your sleeping area so you’re sure to hear it if it rings at night. Make sure you have smoke alarms in every bedroom and one on each floor, including the basement. They can be placed on the ceiling or at least five feet up on the wall. When checking your smoke detector and CO detectors’ batteries, also take a look at the date on the back of the alarm. If the detector is more than 10 years old, it is time to invest in a new one. Consider buying a model with a 10-year sealed battery. This style of alarm comes with a special kind of battery that is guaranteed to last 10 years. You won’t have to change the battery at all during that time, and when the alarm reaches the 10-year mark, you just recycle it and get a new one. 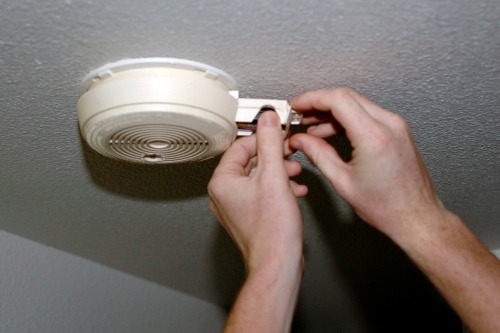 Checking your smoke and CO detectors is an important part of home maintenance. For help with maintenance, contact Hassle Free Home Services.